How is a pediatric dentist different than a general/family dentist? In layman’s terms, a pediatric dentist is one who is specially trained for kids, whose office is all geared towards a child’s positive experience, and who knows how to have fun with kids! Think about it: The average person may not voluntarily desire (and love!!) a profession where they work in kids’ mouths all day. But it’s so great!! Dr. Jon Schaack completed both his dental school training and pediatric dental residency training at Baylor College of Dentistry in Dallas, TX. Baylor College of Dentistry is widely known as one of the nation’s top training programs both in dentistry and in pediatric dentistry. Does your child have teeth? Then bring them in! There are many preventive steps that should be taken to assure your child’s optimal oral health. We would love for you to be educated on these points. The American Academy of Pediatric Dentistry (AAPD) recommends that a child’s first visit to a pediatric dentist and the establishment of a “dental home” be no later than 12 months of age! The AAPD defines a dental home as “the ongoing relationship between the dentist and the patient” which provides comprehensive oral health care. Here your child will receive preventive care, restorative treatment, evaluation of growth and development, coordination with other specialty care (orthodontics, etc) and also emergency treatment when needed. Choosing McKinney Pediatric Dentistry as your child’s dental home will help assure his/her optimal oral health and we know there is plenty of fun to be had along the way! The most common interval of examination is 6 months. Certain patients, however, may require examination with preventive services at more frequent intervals, based upon specific risk factors (medical conditions which affect teeth, clinical and radiographic findings, etc). Of course if there is ever an emergency or special concern, your child may be seen at any time! Please don’t wait until a 6 month check-up appointment if your child is in pain or if there is any major trauma or injury to the teeth. Dr. Schaack even takes calls on his cell phone after business hours for any with urgent questions! It is important to care for the baby teeth in order to assure that permanent teeth are not adversely affected! We all know that untreated cavities in baby teeth can cause pain and discomfort to your child. But untreated cavities also can cause undesired space loss in the dental arch, which can contribute to future crowding and incorrect positioning of permanent teeth. Space maintenance for permanent teeth is one of the most important functions of baby teeth, and keeping them healthy is important! Baby teeth also allow proper chewing and eating, assist in the normal development of the jawbones and muscles, affect the development of speech, and contribute to the child’s attractive appearance. Baby teeth usually begin to be lost at age 6 and continue to be lost over the next 6 years. By age 12, kids are usually in all permanent teeth. You should begin brushing your child’s teeth as soon as they come in! Always use a soft-bristled toothbrush and be sure to brush well around the gum-lines. While it is common for very young children to cry or not want to brush, it is best to stay consistent with twice daily brushing. Eventually they will learn that this is important and something that will be done regularly. Despite young kids’ normal phases of crying when brushing, try to make it as fun as you can for your child! Sing the ABCs or their favorite song while brushing. If you find yourself having to brush the teeth of your crying teenager, you may want to sneak a peak at their iPod playlist to find a song they will like! And remember this about brushing teeth: You only have to brush the ones you want to keep! When you bring your child into McKinney Pediatric Dentistry for a dental visit, Dr. Jon Schaack will spend time showing you the best ways to brush your child’s teeth. It is good to angle the bristles towards gum line and move the brush in a circular pattern. Brush each area for a good 10 seconds or more before moving on to another area of the mouth. This will help the gums to remain in good health and assure improved plaque removal. Never scrub the teeth and gums with great force. Always use gentle pressure in a circular pattern. If you notice that the gums bleed a bit during brushing, it usually means that more time should be spent in these areas. Don’t give up if your child cries when brushing. This only means that you can relate to every other parent out there who experience the same thing from time to time. Children normally go through phases of resistance to brushing and staying positive and consistent is important! What toothpaste should I use? What about fluoride? To avoid risk of swallowing too much fluoride, the AAPD specifies how much toothpaste to use when brushing. “A ‘smear’ of fluoridated toothpaste for children less than 2 years of age” and “a ‘pea-sized’ amount of toothpaste is appropriate for children aged 2 through 5 years.” Once they are 5 years old, most children are better able to spit and the amount is less critical. Parents should dispense the toothpaste and perform or assist with tooth brushing of young children. To maximize the beneficial effect of fluoride in the toothpaste, rinsing after brushing should be kept to a minimum or eliminated altogether. Figure 1. Comparison of a smear (left) with a pea-sized (right) amount of toothpaste. When should I start flossing my kids teeth? What? We’re supposed to floss their teeth also? Yes! However, flossing isn’t necessary until adjacent tooth surfaces cannot be cleansed by a toothbrush. If the front baby teeth come in “gappy”, then flossing may not be necessary until the baby molars arrive. Floss between any tooth surfaces between which there is contact. Disposable flossing sticks can be used if you are worried about your fingers getting bit! When can my child brush his/her teeth on their own without help? Help may be needed up to age 7 and beyond, depending on your observations of brushing techniques and habits at home. Dr. Schaack can evaluate your child’s hygiene and advise accordingly at regular dental check-ups. When should my baby start getting teeth? It is normal for parents to worry that their child’s teeth are erupting early or, more commonly, late! Don’t worry! In most cases, everything will be normal. There is a wide range of normal when it comes to the time frame for cutting the first baby teeth. Did you know that some children are even born with teeth present?!! Others don’t get their first teeth till they are a year old. The first tooth typically will erupt at about 6 months of age. All baby teeth are usually present by age 3. Establishing a “dental home” is a good way to assure that your child is on target for growth and development milestones. How can I keep my child’s risk for getting cavities as low as possible? If your child is on a bottle or sippy-cup, avoid putting them to bed with anything that is not water. “Frequent night time bottle-feeding, ad libitum breast-feeding, and extended and repeated use of a sippy or no-spill cup are associated with [early childhood cavities]” (AAPD). 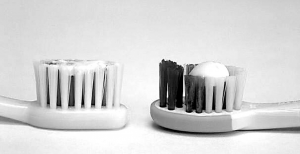 Brushing twice-daily with fluoridated toothpaste will also decrease risk. See FAQs above for more details on when and how to brush. Regular dental check-ups at McKinney Pediatric Dentistry will assure timely and comprehensive preventive care. Protective sealants can protect hard-to-clean grooves and tooth surfaces where cavities are commonly found. What happens if my child has cavities? What if they are uncooperative or anxious? You may feel worried. Relax! You may feel that other kids the same age don’t have cavities. Not so! According to the Centers for Disease Control and Prevention, cavities are the most prevalent infectious disease in our nation’s children. Over 40% of kids have cavities by the time they get to kindergarten. If cavities are found in your child’s mouth, treatment options will be explained to you that address both the treatment needed as well as discussing how to make it a positive experience. A variety of techniques can be employed from simple use of nitrous oxide (laughing gas), to oral conscious sedation, to I.V. sedation, and even to out-patient general anesthesia if needed. It is very important to Dr. Schaack that your child’s teeth be healthy and strong. But it is equally important to him that your child has a positive experience and is excited to return for future check ups! After consulting with you about needed treatment and behavior management strategies available, Dr. Schaack and you will together choose the treatment method best tailored to your child. No worries! Nitrous oxide is a colorless and virtually odorless gas. It is an effective analgesic and anxiolytic gas, which means it can relieve anxiety, discomfort and pain. In children, nitrous oxide may help them tolerate treatment that is not particularly uncomfortable but that requires that the patient not move. In addition to helping to limit movement and contribute to patient comfort, it can reduce gagging. All of these effects work together to enhance communication and patient cooperation and increase tolerance for dental treatment. The AAPD states that nitrous oxide gas “has an excellent safety record….Acute and chronic adverse effects of nitrous oxide on the patient are rare. Nausea and vomiting are the most common adverse effects, occurring in 0.5% of patients.” It has a rapid onset as well a rapid recovery (2-3 minutes) thanks to how well it is absorbed by the body. What is sedation? Is it safe? Oral conscious sedation is an approach used in which children are given medicine prior to the dental appointment that helps them to relax and better tolerate treatment that may otherwise result in a lack of patient cooperation. It may be recommended for children who are apprehensive, very young, have extensive treatment needs, and/or who have special needs. Conscious sedation in the office is mild to moderate sedation in which patients still respond purposefully to verbal instruction (eg, “please open your eyes”, or “please open your mouth wider”). No intervention is required to maintain the child’s open airway, and respiratory and cardiovascular functions are maintained. Before a child receives sedation, a thorough health history is obtained. Consent is obtained after Dr. Schaack and his staff have answered all your questions. Your child is monitored throughout the appointment and medicines are often wearing off soon after the appointment. Instructions are provided (written and oral) for taking care of your child after the dental appointment. With proper initial examination and case selection, oral conscious sedation is safe and effective for young children with cavities! One of the benefits of establishing a “dental home” is that we evaluate growth and development of the teeth and facial structures. Coordination with other specialty care-givers, such as orthodontists, is made when necessary. Referrals to orthodontists are made at the appropriate time for your child based on dental development, function, patient goals, and space analysis. We work very closely with orthodontists to assure that needs are met at the correct time. Thought you would find “all other questions” here didn’t you? The fact is we cannot possibly cover every possible concern in the website’s FAQ. There are textbooks that have trouble containing all the information. The good news is that Dr. Jon Schaack is a board certified pediatric dentist who has answers to your questions. Give us a call or come in to see us if there are questions you still have. We’d love to answer them and assure your child receives the best dental care….and assure that a great experience is had at the same time! !